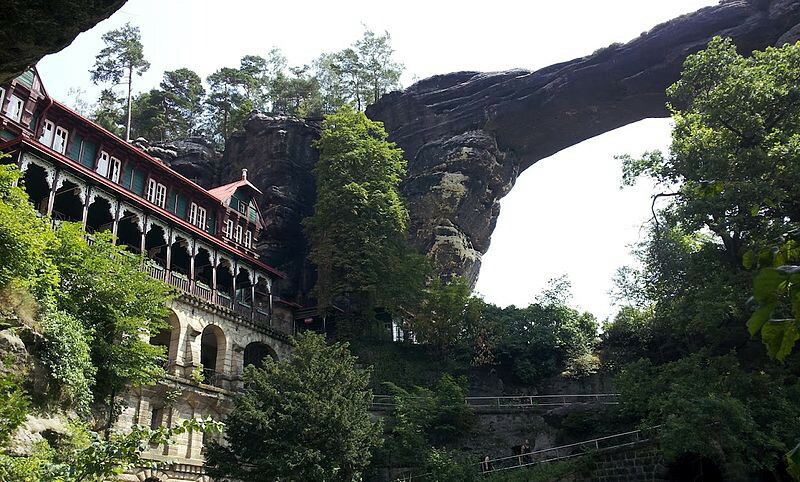 This is Europe’s largest natural stone bridge and part of the Elbe Sandstone mountain range of this area. 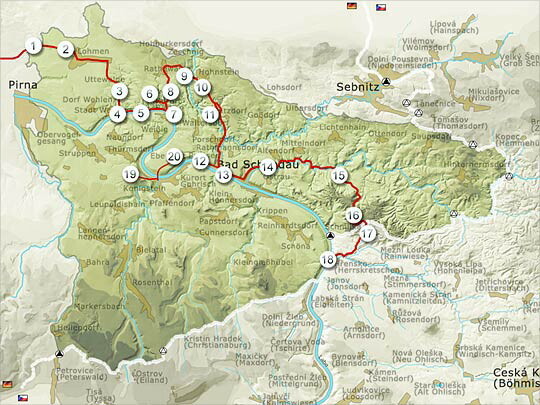 It is located just on the other side of the German- Czech border in Bohemian or Czech Switzerland. As the region was discovered by travellers in the 19th century an inn was built underneath it in 1826 and a proper hotel called Falcon’s Nest in 1881 by Prince Edmund of Clary-Aldringen. The following 100 years and its visitors had such an eroding effect, that in 1982 the arch itself has been out of bounds and tourism activity monitored. Such an imposing structure inspired many artists then, one of them Hans Christian Andersen, and now: landscapes in and around Prebischtor were filmed for The Chronicles of Narnia: The Lion, the Witch and the Wardrobe. The hotel nowadays functions as a gallery and museum, the ground floor containing the period restaurant with original paintings. The Elbe Sandstone Mountains were created over millions of years ago by eroded materials from rivers being deposited in the sea. The variations of the layers were determined by the original material, its size and its chemical properties. Under the pressure of the water, chemical and physical reactions took place which gave the layers their individual properties. As the sea receded and these sediments were exposed to air and water erosion, the layers were carved into a variety of shapes. Add to that tectonic movement and volcanic activity, not everywhere and all the time though, and you get today’s amazing and diverse mountain range which is an important ecological habitat in Europe. For more details on the geology and history have a read here. The mountain range is situated in two countries, Germany and the Czech Republic, and has been declared a national park in both of them. This ensures the thorough protection of small and isolated microclimates. Unique amongst the Central European Uplands are the constant changes between plains, ravines, table mountains and rocky regions with undeveloped areas of forest. This diversity is ecologically significant. 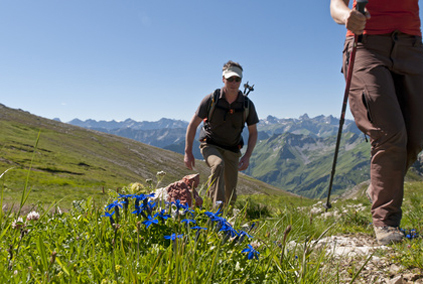 The variety of different locations, each with its own conditions in terms of soil and microclimate, has produced an enormous richness of species. The numbers of ferns and mosses alone is unmatched by any other of the German central uplands. 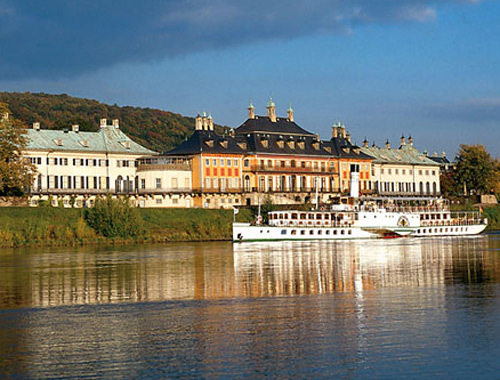 During your day walk on your Active in Eastern Germany tour you will be able to observe this diversity first hand and enjoy the spectacular panoramic views from several lookout points. 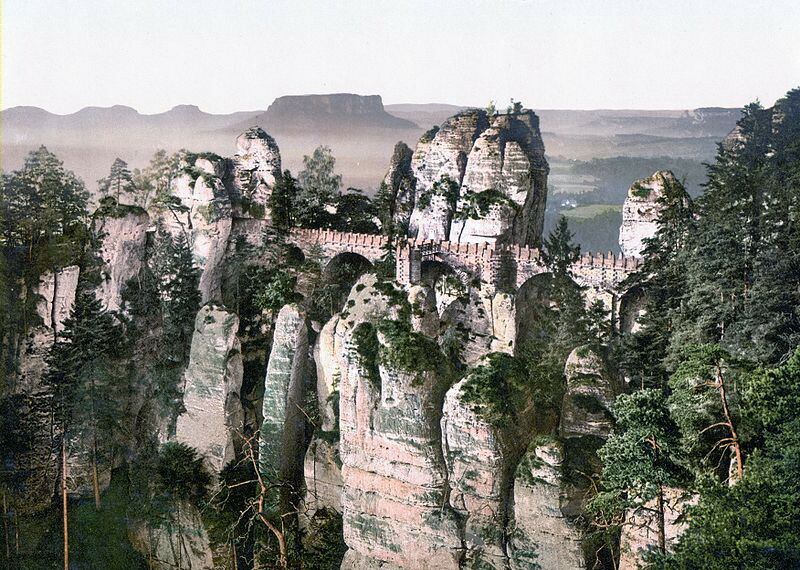 The Bastei around 1900, in 2004 and an artist’s impression from 1826. The Bastei is a rock formation in the Elbe Sandstone Mountains near Dresden, towers 194 metres above the Elbe and reaches 305 metres above sea level. Over 100 million years ago it was formed through water erosion of the sandstone area. The name Bastei, ‘bastion’, indicates its inclusion in the old defensive ring around Neurathen Castle, which is an open-air museum/ruin nowadays. Since the 19th century it has been a very popular tourist location, attracting painters, writers, musicians and plain folk to experience the dramatic scenery. 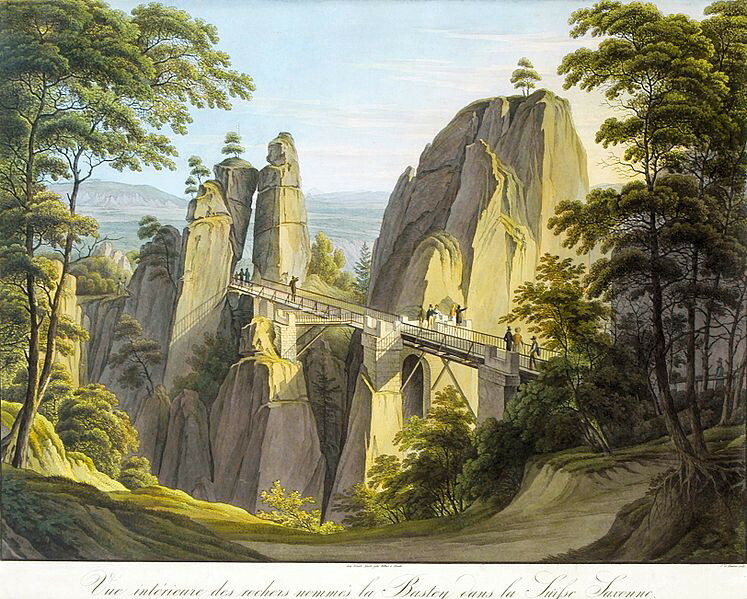 But as early as 1750 in the general exploratory stages of the nation, many young writers and artists went in search of uncharted territory within their home land and discovered the rugged beauty of the sandstone mountains in the Saxon Swiss Mountains. They tended to follow the same path, which became later known as the Malerweg, the painters’ path. In the first 100 years of their ‘discovery’ no less than 30 more or less known travel guides were published describing the mountains, their ascent and the terrain. 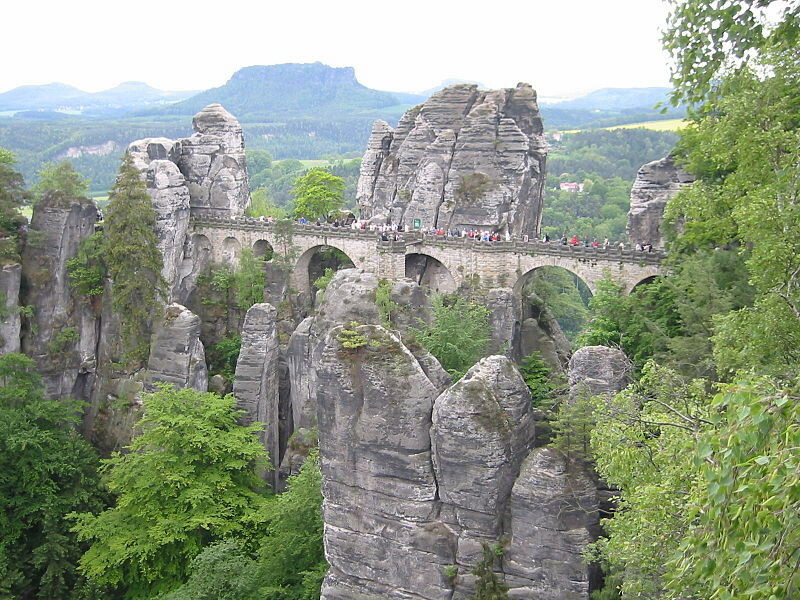 The following influx in visitors meant constant improvements of the routes, for example building a new ascent to the Bastei (1818) or a new bridge to the Hockstein (1822). 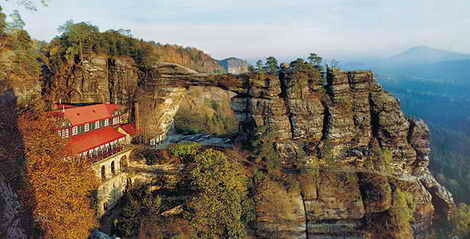 But, not only bridges were built, inns were as well, providing the travellers with well-earned and needed refreshments. In 1812 a local butcher found a niche market and in 1816 was given the licence to sell liquor! In 1819 even Goethe commented on the pleasant fact that “Friendly huts and good service with coffee, double beer, spirits and fresh bread and butter really revived the tired wanderer…”. And not much has changed in this regard: tourists are very welcome in the region and catered for in the many guest houses and huts along the travel routes. 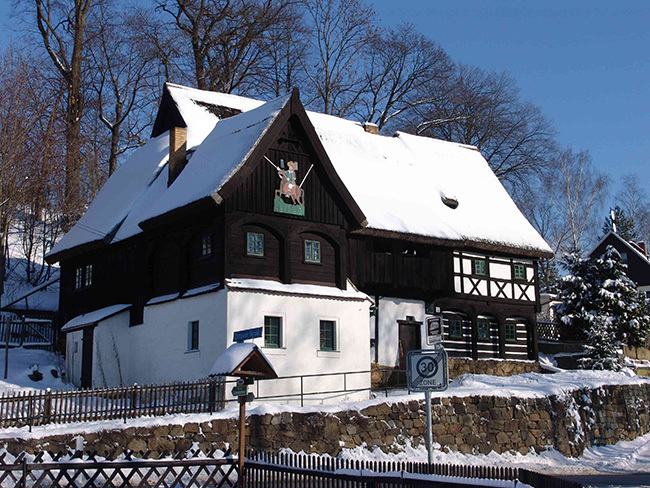 Many of these guest houses will be in the classic Umgebindehaus style, a timber-framed, log styled house using building stones as well. A design typical for this region and very pretty to look at. 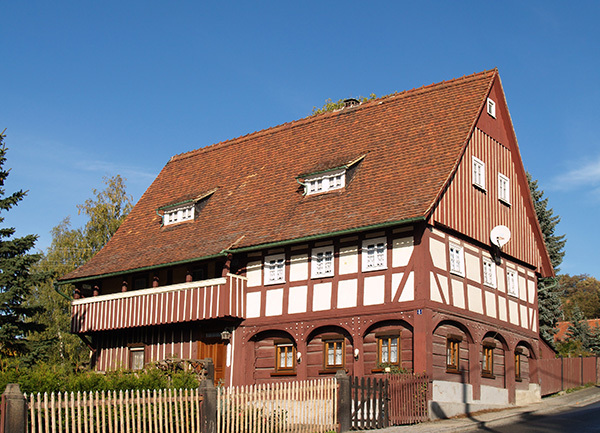 During your stay in Hinterhermsdorf and the trips in the following days on you Active in Eastern Germany tour you will see some fine examples of this regional architecture. We had the honor to accommodate a reporter of THE PRESS, Christchurch on one of our recent tours around New Zealand’s north island. Have a look at his article and read what he experienced during his trip with our German speaking group. The city is situated along both banks of the river Elbe, enjoys a mild, ‘humid continental climate’ and has been called Elbflorenz, the Florence at the Elbe. It is one of the greenest cities in Europe, with 63% of the city being green areas and forests. It is surrounded by the Elbe Sandstone Mountains (Elbsandsteingebirge) and the Ore Mountains (Erzgebirge) and lies in a picturesque river valley. 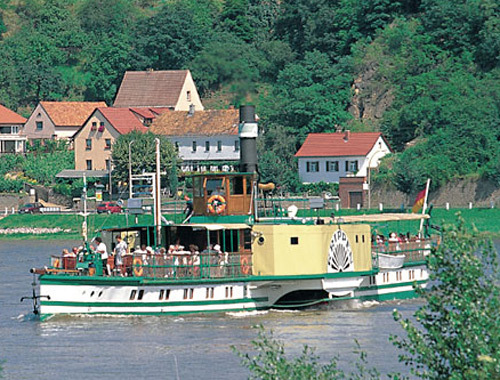 The best way to enjoy this particular landscape (hence why we do it on our Active in Eastern Germany tour) is to get on board of one of the oldest steamboats in Germany and let the landscape glide past you. 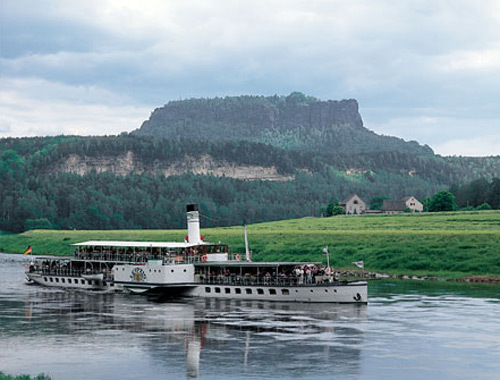 The Sächsische Dampfschiffahrt, the Saxon Steamboat Company, offers a range of tours which take you either along national parks and imposing sandstone formations or to impressive castles and romantic villages along the river and much more. The proximity of river landscapes and mountain landscapes makes for a unique stay in the region, discovering the huge range of natural and man-made wonders. 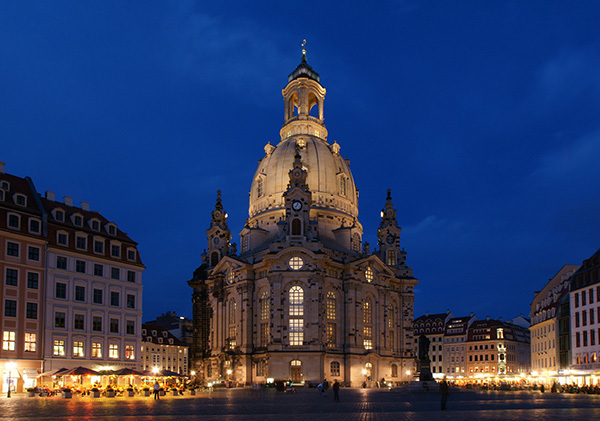 As Dresden had been a royal residence for the Electors and Kings of Saxony for so long, its architecture was always at the cutting edge of the times. It’s not only a Baroque and Rococo jewel box, but also has fine examples of Renaissance, Historism, Classicist, Modernism and Postmodernism styles on display. As to be expected the royal buildings will give a most comprehensive view of the older styles: the Dresden Castle for example has existed since 1485 and had been renewed, expanded and restored so many times that it is a mix of at least three styles. Another one, the Zwinger palace, shows the transition from military use (place for cannons between outer and major city walls) to entertainment, art and festival use by the court. Today that function has survived and it houses galleries and exhibition spaces. Another group of imposing monuments are the sacred buildings scattered around the city. 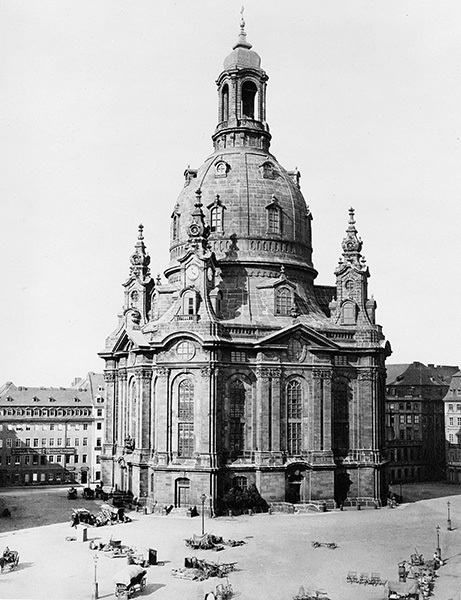 The most famous would have to be the Frauenkirche due to its destruction in WWII, the reconstruction and following association of peaceful protest in the GDR. And, as to be expected, modern architecture is seen as controversial and highly debated amongst the people that have opposing views of what the development of the cityscape should do: preserve the old at all costs or develop the new or try to reconcile and have both live side-by-side. 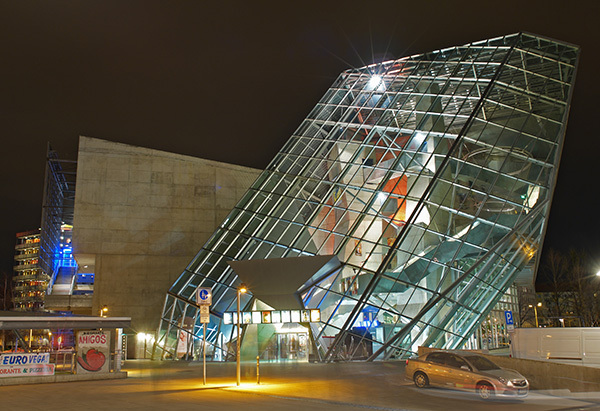 Some ‘controversial’ examples of modern architecture would be the UFA Kristallpalast, an ultra modern cinema complex, the Transparent Factory of Volkswagen and the New Synagogue. 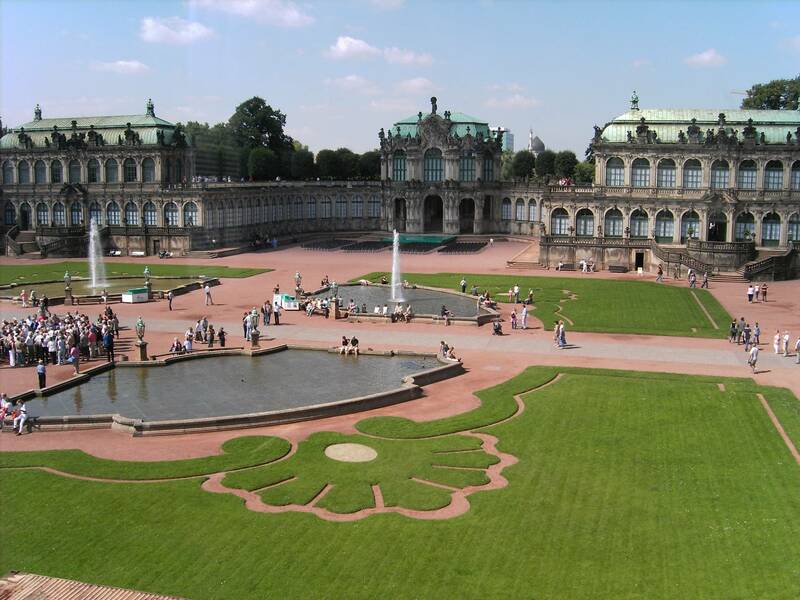 You can get a first hand impression of Dresden’s stunning and diverse architecture on your Active in Eastern Germany tour. The city’s name is derived from the Old Sorbian word “Drezd’any”, meaning ‘people of the forest’. 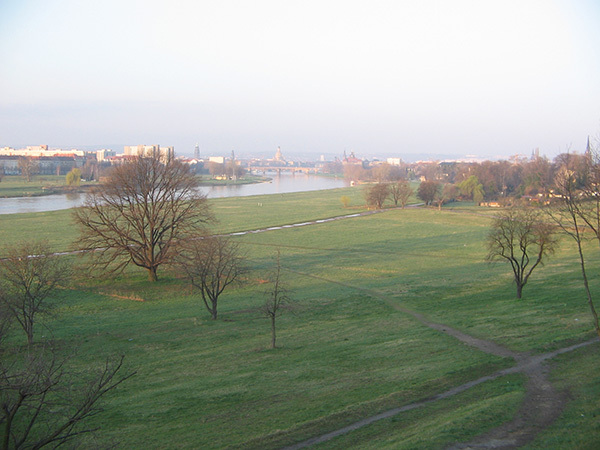 Even though as far back as 7500 BC proof of habitation has been found (Linear Pottery), the main settlement of Dresden happened in the 10th – 12th century by Slavic tribes who had ventured east as part of the Germanic expansions. 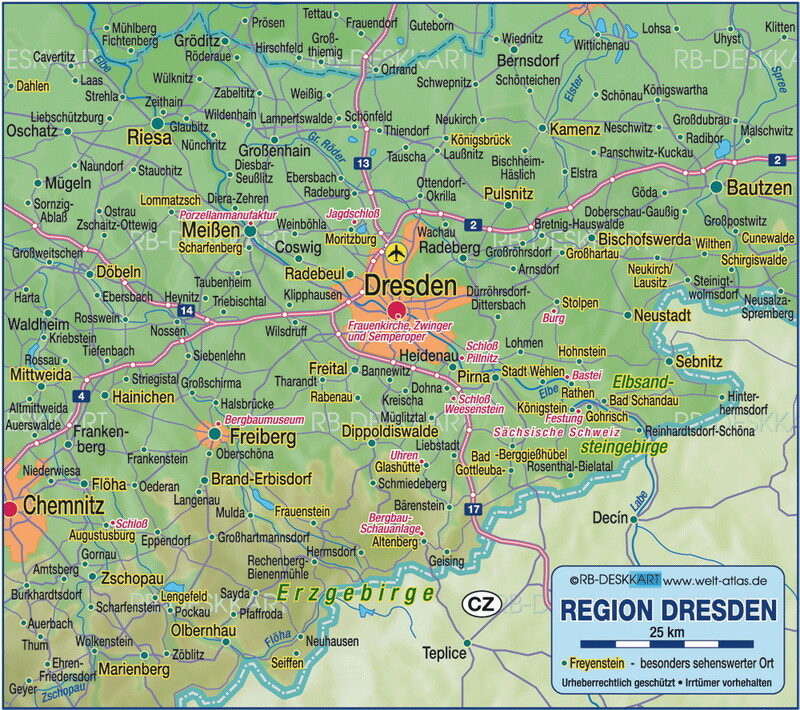 In the 10th century the region was established in the Margraviate of Meissen (Meissen lies ~20kms north of Dresden) which also furthered the settlement of more and more people in the region. The city expanded due to mining in the nearby Ore Mountains (Erzgebirge) and over the next centuries it evolved into the capital of Saxony. 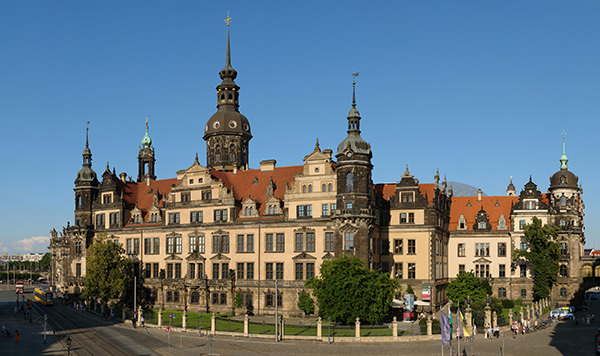 In 1270 Dresden became the capital of the Margraviate of Meissen and over the centuries became the seat of the dukes and electors of Saxony as well. 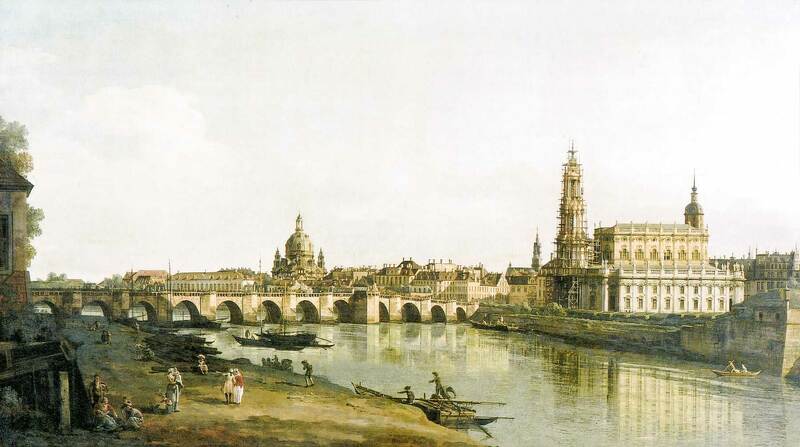 Due to the ‘royal’ presence Dresden became also a centre of culture and the arts. Its nickname ‘jewel box’ is due to the extraordinaire amount of ornate buildings, cathedrals and museums which had been built in the Baroque and Rococo style. Unfortunately the majority of these buildings in the city centre were destroyed during the aerial bombing at the end of WWII. After the war the GDR rebuilt many important historic buildings as well as re-designing the city in a ‘socialist-modern’ style. Since the reunification more work has gone into restoring and saving historical monuments, with a lot more needing to be done. 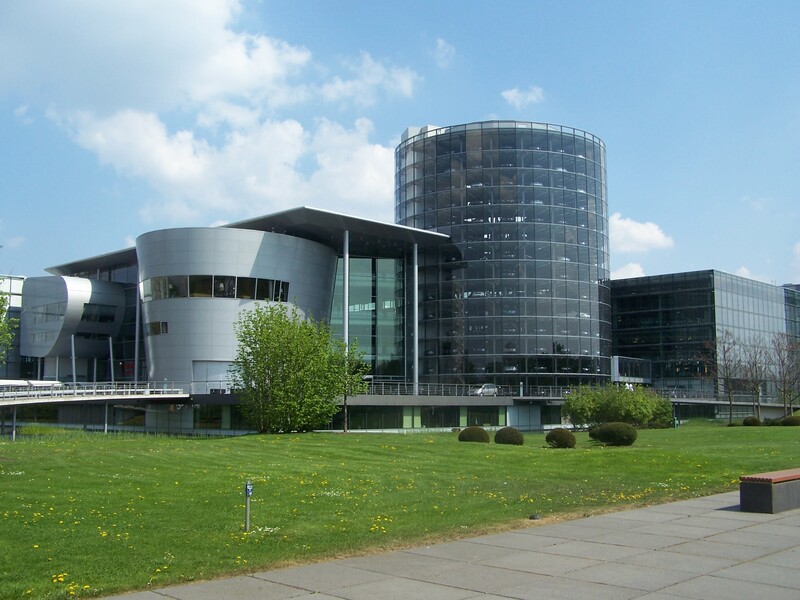 On your guided city tour on the Active in Eastern Germany tour you will get to see the varied architecture throughout the city and find out more about its history.